Tonight’s meal was positively exquisite. 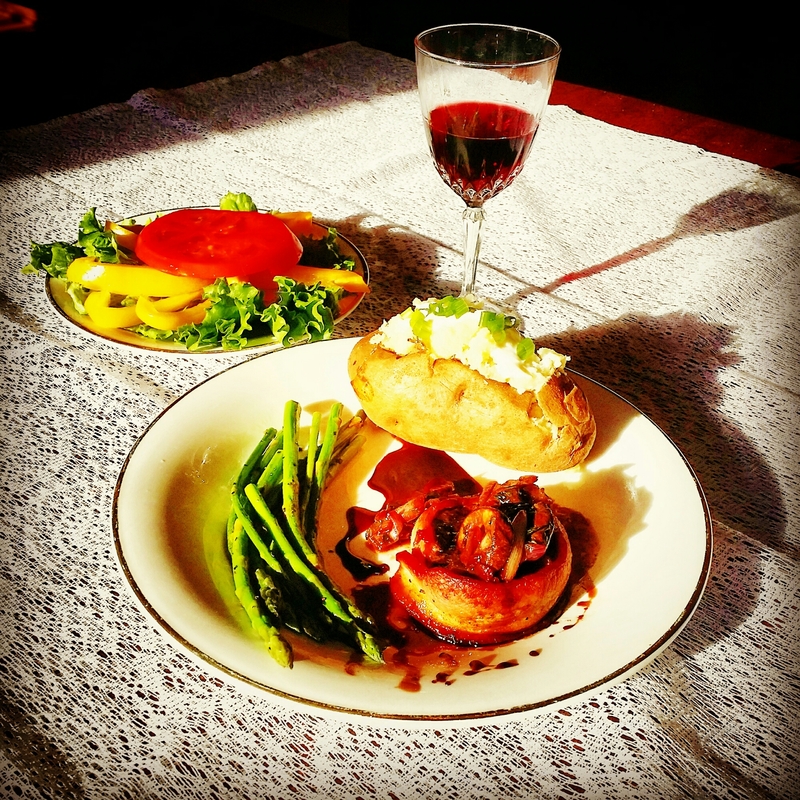 The Unplanned Chef used fillet mignon and wrapped it with bacon before broiling and the results were phenomenal. Start will the sauce as you will want it to thicken. Using a medium sized sauce pan, combine the vinegar and wine over medium high heat, when the mixture begins to bubble add the sugar. Allow mixture to reduce to half. Will yield one cup. Set the mixture aside and begin preparing the meat. Using toothpicks, wrap the bacon slices around the fillets. Add salt and pepper to both sides of the meat and set aside. Always allow ample time for the meat to set, and make sure it is at room temperature otherwise the meat will become shocked when you add heat to cook. Add one tablespoon of olive oil to a medium sized pan and heat the oil over medium heat. Add the fresh parsely and mint and sautée for a few seconds. Add the onions and cook until tender, then add the baby portobello mushrooms. Allow to absorb the juices and then turn off heat and set aside. In a casserole pan, line the bottom with the asparagus and coat with butter and garlic, broil in the oven until tender. Now take the same pan you cooked the asparagus in and add the fillets. Do not remove the garlic or the butter as the meat will absorb and add to the flavor. Broil and flip the meat one time, cook until the bacon is fully cooked, around 5 to 6 minutes in total. Remove the meat and top with mushrooms and onion, feta cheese, and the red wine and vinegar sauce. Lay the asparagus next to it. Voilá another fantastic meal from the Unplanned Chef.